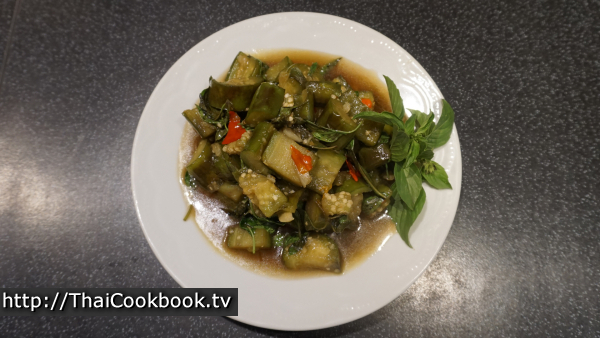 This simple yet completely delicious stir-fried eggplant makes a nice side-dish that goes well with many other types of foods, or it can be a great vegetarian lunch when served with a little steamed rice. Our long green eggplant, known in Thailand as Makua Yao, is cooked and seasoned with just a little hot chili, garlic, and soy sauce. 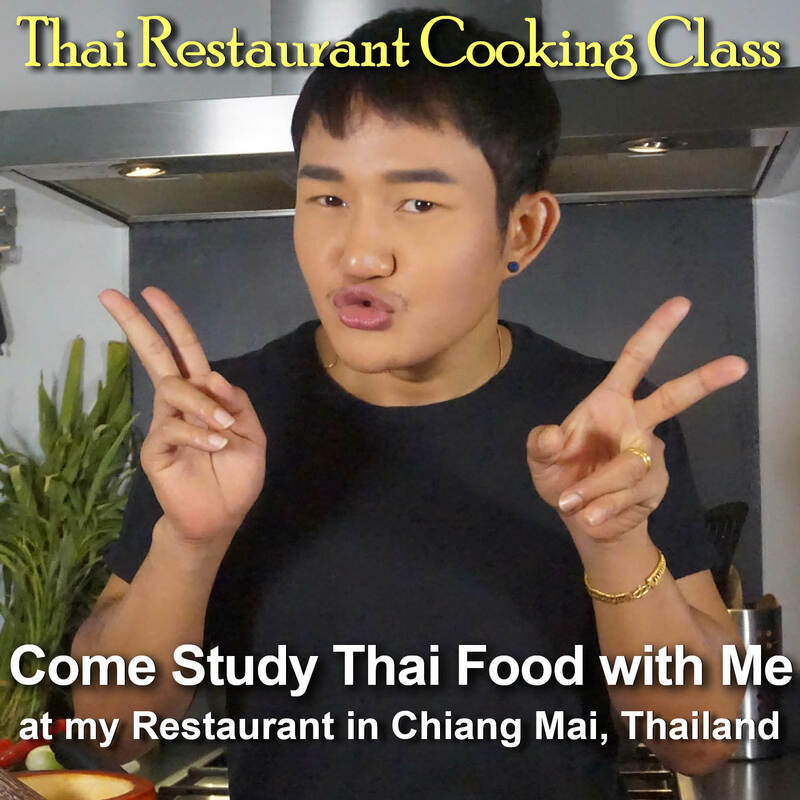 We toss in a healthy portion of our fragrant and flavorful Thai sweet basil, known here as Horapah, which contributes the subtle flavors of licorice, anise, and other familiar spices. If you are not a fan of spicy foods, leave the chili out for an equally delicious result. 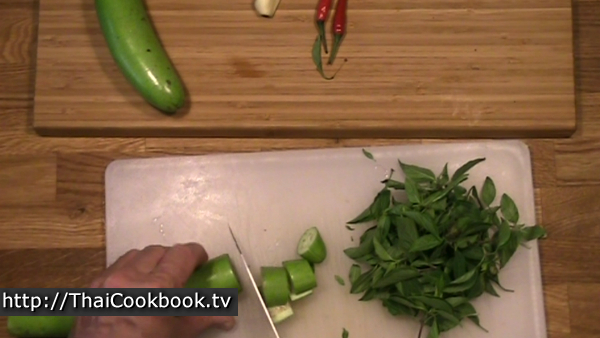 This recipe comes out great with any type of eggplant that you have locally available. What's in our Vegetarian Stir-fried Eggplant with Sweet Basil. 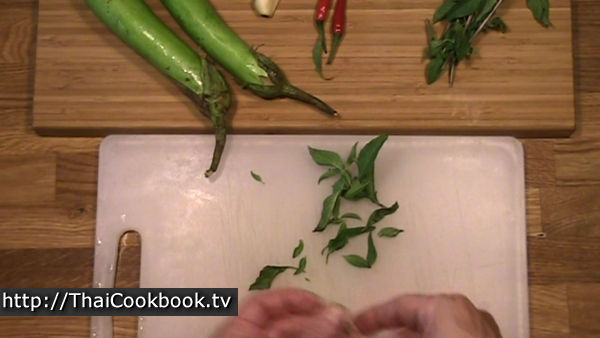 How we make our Vegetarian Stir-fried Eggplant with Sweet Basil. 1) Cut the eggplant into large bite-sized pieces. Pluck the basil leaves. Crush the garlic and chili together. 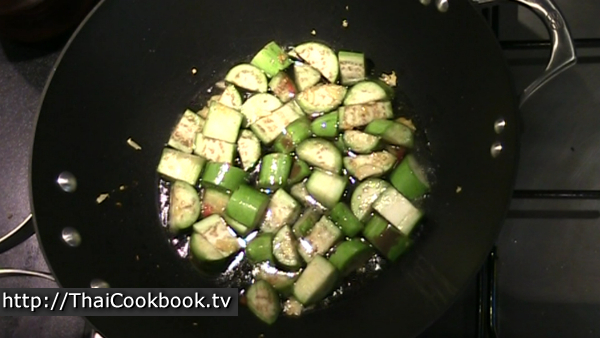 2) Fry the garlic in oil until fragrant, then add the eggplant and 1 cup of water. 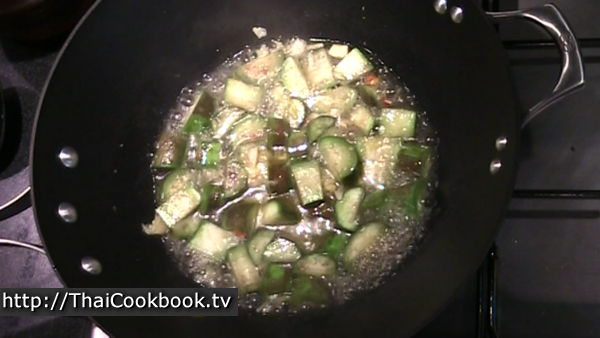 Cook for about five minutes, or until the water is nearly gone and the eggplant is soft. 3) Season with sugar and soy sauce. Cook for one minute more, then turn off the heat and toss in the basil. Serve with steamed rice. 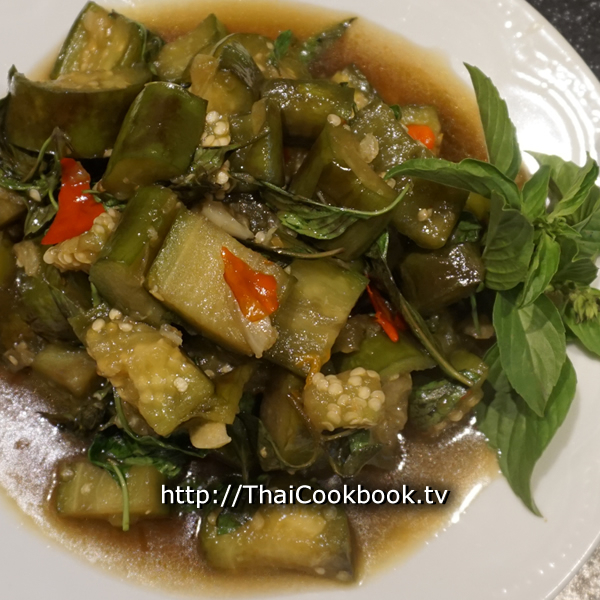 For this recipe we use a long green eggplant called Makua Yao in Thailand. It is similar in flavor to almost every other eggplant, so if you don't have these where you are, just use what you have and it will come out great. 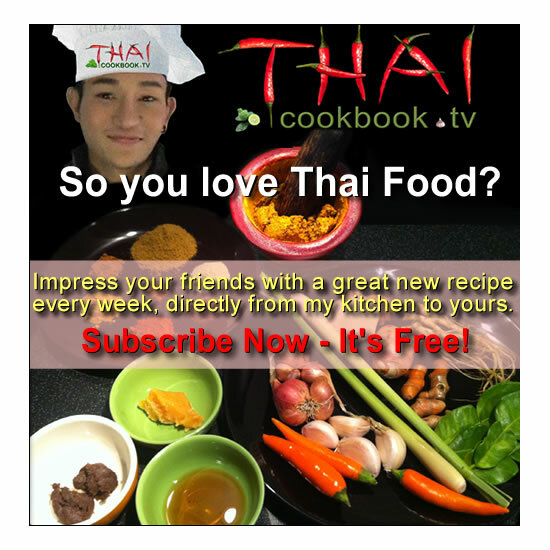 The basil we use is Thai sweet basil called Horapah. It has a strong flavor of licorice or anise. However, any type of basil should produce a delicious dish using this method. Pluck the leaves and flower tops from the basil until they measure 1 cup of loosely packed leaves. Split the long eggplant lengthwise down the middle, then cut the halves into 1 inch pieces. Crush the garlic and chilies. Add oil to a wok or frying pan. Stir in the garlic and chili and fry for about 30 seconds. 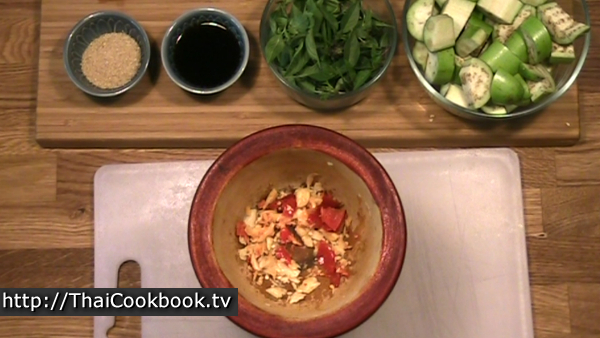 Add the eggplant and stir into the garlic, chili, and oil. 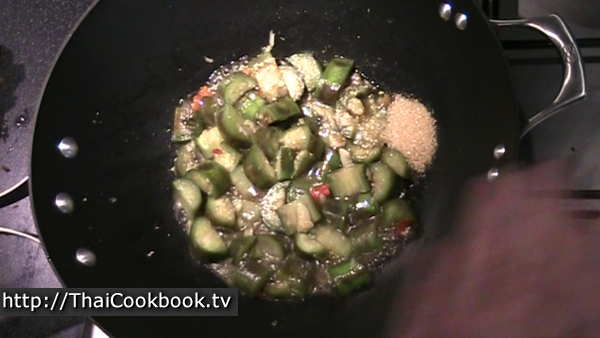 Add about 1 cup of water to the eggplant and stir it up well. Cook over medium high heat for about 5 minutes, stirring often. Add small amounts of water only if needed to prevent sticking. After about 5 minutes the eggplant should be soft, and the water reduced to just a little sauce. Add the soy sauce and sugar, and stir into the eggplant carefully. Cook for 1 minute more on high heat. Turn off the heat and toss in the basil carefully so you don't mush up the eggplant. Serve on a plate to be shared as part of a family style meal, or serve each portion over rice on individual plates. Garnish with fresh basil tops.